Ticket purchase is available online this year, why not give it a try. 2019 Season will be starting up on May 4th. 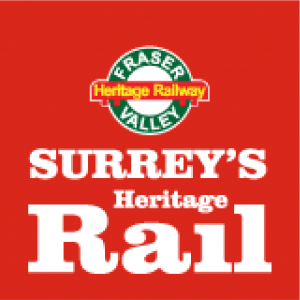 We are a volunteer group; we operate the Interurban on weekends only (Saturday and Sunday,) from the beginning of May until the end of September, subject to track availability. We DO NOT operate on STAT HOLIDAY Mondays. Our train schedule for all Saturdays and Sundays ONLY. Trains start boarding 10 minutes prior to departure and passengers are encouraged to be at the station at least 15 minutes before departure. All trains depart from the Cloverdale Station (Hwy 10 & 176A St); round trip is 55 minutes duration. The route goes from Cloverdale to Sullivan Station (64 Ave. & 152 St.) and immediately returns to Cloverdale. 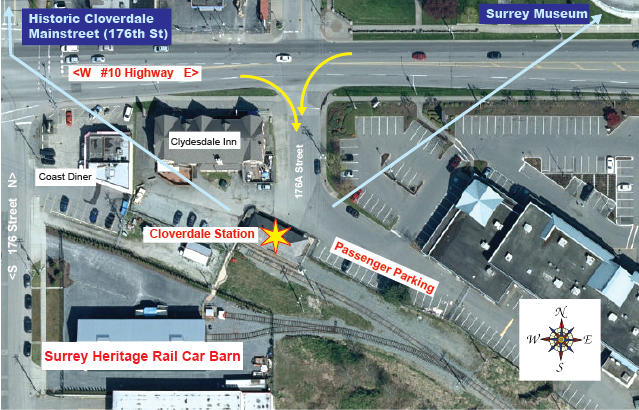 Cloverdale station opens @ 9:30 am – closes after the passengers return on the last train – usually about 4pm. Operational dates and times are subject to track availability and equipment operation: Please check this page and our Facebook page for any schedule changes. As with any railway, motive power, schedules and fares are subject to change without notice. Adverse weather conditions or technical/safety problems may prevent operations. Available on return from the Interurban ride, except the 3.00pm train. • Children 12 and under = FREE accompanied by an adult. The Velocipede is located in the Cloverdale Discovery Centre. Try out the velocipede during your Tour! We accept cash, credit & debit cards. Tickets are available online through Eventbrite up to 24 hrs before the train time. This guarantees that you get a seat. Remaining tickets are also sold at the ticket office up to 1 hour before departure (9:30 for 10 am departure). We do not accept reservations, or sell tickets for later trains. Please note that tickets are sold for available seats; if you have a ticket, you will have a seat. Groups of 10 or more, whether online booking or purchasing tickets at the station, are advised to make arrangements by calling the station 604-574-9056 at least three days before the date of travel, to ensure that your requirements are accommodated. Station and train are accessible for those with disabilities. Wheel chair passengers must be able to transfer to the FVHRS transit wheel chair for access through the narrow train doorways. All wheel chair passengers must be able to transfer to the fixed seating on the train. Accessible washrooms are available at the station. Passenger parking is available at the East side of the Cloverdale station. Please do not park in the Clydesdale Inn or Country Diner parking lots adjacent to the station when riding the interurban. Click here for train times and pricing information. Click here for an historical journey with photos, videos and more! Click here to help fund the restoration and operation of the BCER.